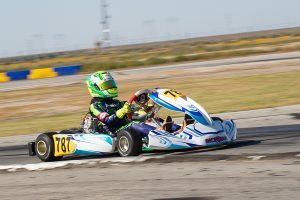 The 2019 California ProKart Challenge began its season with the opening round held at the Buttonwillow Raceway Park in Buttonwillow, California under welcome sunny skies. The March 30-31 event was the first of the 15-year celebration for the Superkarts! USA regional program, and marked a new change in format that also seemed to be a big hit with both new and seasoned California PKC racers. The action was held on Saturday-Sunday and featured the new Qualifying-Prefinal-Final structure. Portions of the $120,000, the largest prize package in series history, were handed out on the weekend as 120 competitors contested the first of six rounds toward the championships in the 16 categories. 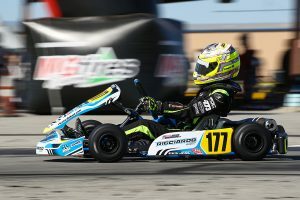 Multi-time California PKC shifterkart champion Billy Musgrave nearly pulled off the sweep in the Rolison Performance Group X30 Senior division. Musgrave posted a 49.369-second lap to secure the top position in qualifying. After an early challenge from Travis Wiley, Musgrave secured the win in the Prefinal as three-time SKUSA Pro Tour champion Ryan Norberg worked up to second from fourth. At the start of the Final, Musgrave was hit hard from behind, and spun off into the dirt. That allowed Norberg to lead all 25 laps of the main event for his first series victory, ahead of Jacob Gulick by five seconds. Musgrave fought back, knifing through the 20-kart field with fast laps of the race to finish third. Defending champion Joseph Daniele was fourth, with Michael Michoff finishing fifth. Musgrave continued his streak in the headline shifterkart division of the program, earning the sweep in the new Croc Promotion USA/Mad Old Nut Pro Shifter category. Musgrave was perfect in 2018 in the S1 Pro Stock Moto division, and that continued into the new IAME SSE 175cc engine platform. Billy posted a 47.157-lap in qualifying for P1, before leading all 12 laps of the Prefinal. Andrew Bujdoso grabbed the holeshot to lead the opening circuit of the Final – until Musgrave secured the position, and ran away to an eight-second advantage after 25 laps. Musgrave made it a perfect score, posting fast lap of the race. Bujdoso and Cody Hodgson completed the first Pro Shifter podium. The new Musgrave Racing Company Pro Shifter 2 division was swept by Arizona driver Micah Hendricks. 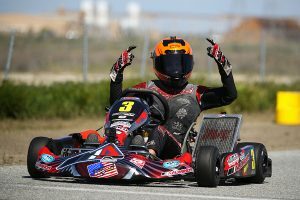 The 2011 California PKC S5 champion was perfect on the day, setting fast time in qualifying before leading all laps in the Prefinal and Final. The 2018 S3 champion Emon Fazlollahi and S3 graduate Kyle Loh joined him on the first podium for the category at California PKC. Three sweeps in the same race group as SKUSA Pro Tour champion John Crow scored maximum points in the new Alpinestars G1 Gladiator class. Crow bested SKUSA SuperNationals winner Rob Logan and Vivek Tandon to become the categories first victor. The Morgan brothers dominated the Nash Motorsportz X30 Junior division. Cole Morgan set fast time in qualifying, edging out SKUSA WinterNationals winner Branyon Tiner and Blake Nash by 98 thousandths. Cole fought off Tiner early on in the Prefinal, keeping Nash and brother Carson Morgan back at the checkered flag. The four battled throughout the Final, with Nash getting shuffled back and Dustin Salaverria taking his place in the group. Carson Morgan solidified his spot at the front by lap 15, leading the remainder of the 22-lap event to score his first Junior victory. Salaverria finished second, with Tiner completing the podium. Cole Morgan ended up fourth, and Josh Pierson a close fifth. The second largest category on the weekend was the new Allen Berg Racing Schools KA100 Junior division, making its season debut with the California ProKart Challenge with 19 drivers. Stephen Eisert became the first driver to earn fast time in qualifying, but it was Branyon Tiner stealing the show. Cole Morgan beat out the field in the Prefinal, only to lose the win due to a three-second penalty for pushing at the start. That gave Tiner the win, coming up from fifth on the grid. To grab the victory, Tiner had to fight off a line of challengers. First was Kyriakos Sioukas, then Eisert for a few laps before Jacob Yesnick charged from 19th on the grid to fight for the top spot. Yesnick led at the white flag, with Tiner working past in the final corners to secure the victory. Sioukas joined them on the podium in third with Eisert fourth and Josh Pierson fifth. Also new for the 2019 season is the Doran Motorsports Group KA100 Senior category, fielding 16 drivers. Qualifying was decided by one thousandth of a second, with Oliver Calvo putting his name in the record books as the top qualifier and Aiden Kempf just missing out. Calvo led all 12 laps of the Prefinal, with Kempf holding off Nick Ramirez and Nick Persing for the outside row one starting position. Calvo would not end the day on top, getting shuffled back during the 22-lap Final and receiving a penalty to end up 10th overall. That allowed Kempf to lead the majority of the race to finish first; however, a jump start cost him three seconds. That penalty handed Persing the victory and put Ramirez to second ahead of Kempf. Alan Tang and Christopher Martin completed the top-five. The International Kart Federation KA100 Master division rounded out the new categories for 2019. Ricardo Arruda scored the victory, beating out top qualifier and Prefinal winner Ron Jenkins, with Terry Giffen joining them on the podium. It was a near sweep for Jesus Vasquez Jr. in the Ace High Designs Mini Swift class. Vasquez set fast time in qualifying, where the top four were separated by just 29 thousandths of a second. He led all 10 laps of the Prefinal for the provisional win, only to be handed a three-second penalty for a jump start. That moved him down to third and put John Antonino on the pole position for the main event. It took three laps for Vasquez to retake the top spot, going on to post fast laps of the race en route to a 2.7-second advantage for the victory. Antonino, the 2018 Micro Swift vice-champion, was second in his debut – with Ryan Persing completing the podium. Defending IAME USA West Micro Swift champion Graham Trammell was able to better his sweep from Buttonwillow last year by earning a perfect score. Trammell swept all the sessions for Round One, adding fast lap of the main event to earn maximum points toward the championship. He won by 14 seconds over Rocky Moran, with Alex Mercado joining them on the podium in third. Steve Martin and Stuart Hayner were winners in the Empire Karts X30 Master and AiM Sports X30 Super Master divisions, respectively. Martin bested top qualifier and Prefinal winner Jure Gaspar by four seconds in the main event. Hayner swept his class, outrunning Jeff Rice and Federico Aquini. Nick George swept the S4 Master Stock Moto division over Peter Abba and Brady Blanquette, while Brett Harrelson went perfect in the Bell Helmets S4 Super Master Stock Moto class ahead of Levi Bennett and Jorge Menchu. Jacopo Pizzinato won in his Honda Racing/HPD S3 Novice Stock Moto debut, as top qualifier and Prefinal winner Vicente Salas retired with two laps remaining. Brandon Banducci was runner-up. Ansel Baldovin became a new winner in the Evinco Tires S5 Junior Stock Moto category. Kailey Meris and Mathias Coito completed the podium. 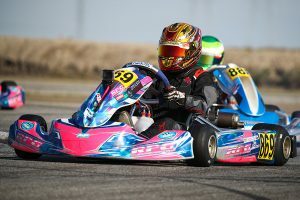 The second event of the 2019 California ProKart Challenge features another first for the program in its 15th season. 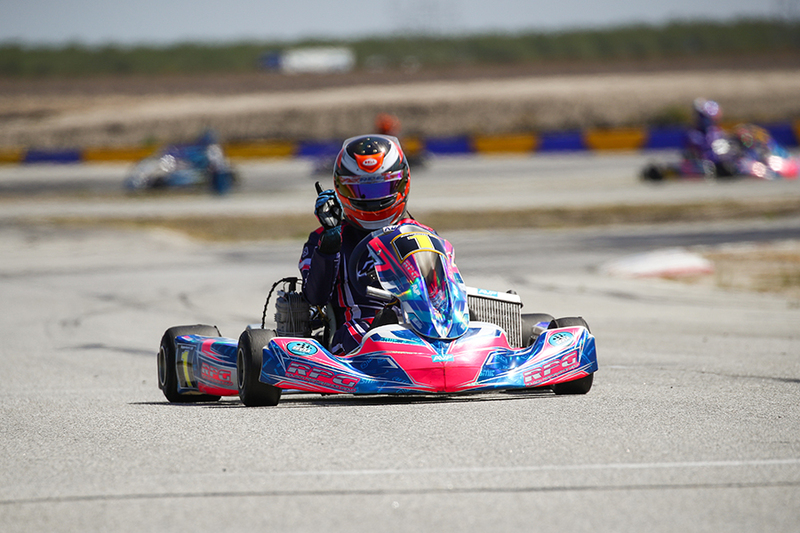 On June 7-9, the CalSpeed Karting facility will host a double-round weekend for the SKUSA regional program, as competitors will contest Rounds Two and Three of the championship chase in what will be the lone three-day event of the season. For more information on anything related to Superkarts! 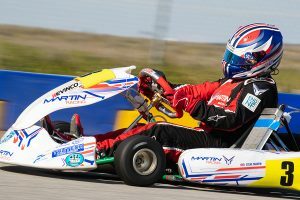 USA, please visit the website – www.superkartsusa.com and be sure to follow the Superkarts! USA Facebook page, Twitter and Instagram accounts.